The Stanley Picker Gallery will be hosting a series of participatory events throughout Spring 2013 in collaboration with Circus and Bread, a collective of artists and MA graduates from the Faculty of Art, Design & Architecture at Kingston University. The collective take their name from a phrase used to characterize the frivolity of the late Roman Empire, when in 140 BC politicians determined to achieved power over the masses through distribution of cheap food and staged entertainment. Circus and Bread, united by a shared belief in the importance of conversation and communication within art, devise and deliver one-off participatory events which embody and commence dialogue around this central theme. Bring a first time gallery visitor to meet Circus and Bread and the Gallery Team, contribute to a patchwork of bread packets and enjoy an offering of coffee and home made bread with marmalade. While busying themselves with eating and stitching, visitors will be invited to discuss the theme of upcoming Circus and Bread event The Banquet on 27 March. Wednesday 27 March 5-7pm Free All Welcome. 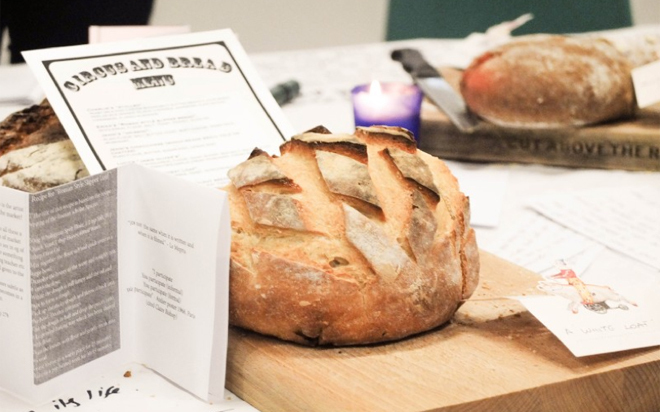 Prior to Easter weekend, Circus and Bread invite members of the public to ‘break bread’ with food and conversation around a banquet table in the Stanley Picker Gallery Lobby. The table will be the central focus of the event, where Circus and Bread artists will facilitate conversation, through informal performance lectures against a backdrop of short films and text pieces. They will invite visitors to respond the The Banquet through discussion and by inscribing their experiences on the Circus and Bread tablecloth.